World 6-8 is the eleventh course of World 6 in Puzzle & Dragons: Super Mario Bros. Edition. 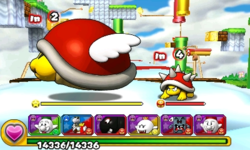 It is a sky level with enemies consisting of Heavy Para-Beetles, Spinies, Para-Beetles, Bullet Bills and Lakitus. This level is straightforward: the player faces a single battle, finds a ? Block, faces two more battles, finds another ? Block, then faces two more battles before the boss fight with a Banzai Bill. The player has all Orb types on the Orb field for this course. ★World 6-8 is a difficult version of World 6-8 from ★World 6, with Fire and Wood Orbs disabled from the Orb field. This page was last edited on August 15, 2017, at 22:39.